All the guidance you need is provided below. If you need further assistance, please call 1-855-548-8108 and one of our product experts will guide you to the right corner view safety mirror you need. You can also check out our entire offering of safety mirrors here. Why buy safety mirrors?For one, safety and security mirrors help keep an eye on employees and reduce theft and wrongdoing in the workplace. They also help employers comply with necessary inspections while allowing management to monitor employees at work. More importantly, safety mirrors figure a great deal in avoiding accidents and injuries around blind aisles and corners. This is quite important particularly in warehouses where heavy-duty equipment are in use most of the time, and collision can prove fatal. Shape - Quarter-dome mirrors offer a 90° viewing angle and are the best choice to see around corners in hallways and corridors. They can also be wall or ceiling mounted. 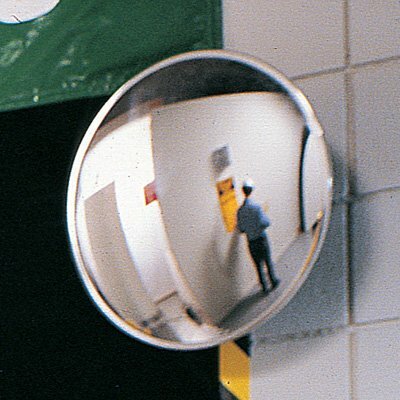 Round mirrors, on the other hand, offer a 160° viewing angle and feature a unique ball-swivel mount for mounting flexibility for multiple applications. Size - From 8 sq. ft. to 800 sq. ft. of viewing area, Seton offers a wide array of sizes to meet your exact viewing requirements. Material - Acrylic safety mirrors are the most popular, primarily due to the fact that they are lightweight and shatter-resistant, making them perfect for all industrial and non-industrial application. Glass mirrors, on the other hand, are scratch-resistant and offer the best clarity. Still need help? Call us at 1-855-548-8108 to learn more about our corner view safety and security mirrors.